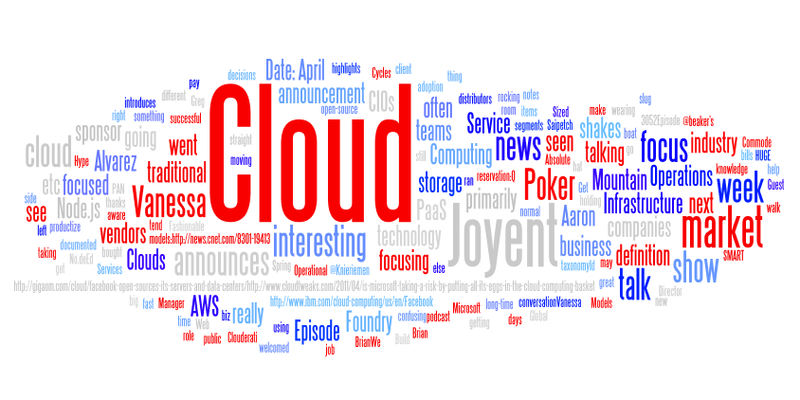 I was playing around with Wordle.net today and plugged in The Cloudcast (.net) to see what sort of Cloud Map it would create. We'll revisit this every couple of months to see how much the discussions have changed. The shape reminded me of a wavelength that we frequently see when editing the audio of the podcast. The shape represents the "breadth" that Brian takes right before he asks a question or starts a sentence. It's an annoying habit (we all have some speaking quirk), but luckily for our listeners they usually won't hear it on the final version. Episode 8 - "Get off your PaaS and Build Clouds"
Episode 7 - "From the News Desk"
We welcomed another sponsor this week (Cloud Concierge - http://www.thecloudbutler.com), offering Cloud consulting to CIOs. Episode 6 - "Is Cloud Computing Fashionable for IT?"